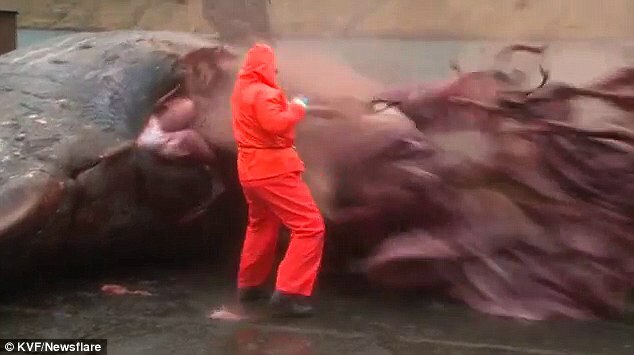 Watch this freaky video of a dead sperm whale exploding when a biologist cuts open its carcass. The 45ft sperm whale had washed up dead on a beach in the Faroe Islands. The whale had been there two days when marine biologist Bjarni Mikkelsen tried to cut it open. But as soon as Mikkelsen began making incisions on the huge creature, the methane gas trapped inside the whale exploded, spewing out tons of organs and guts that almost knock him flying. “The animal was more than two days old when we took it so we knew there would be some pressure on the inside, but nothing like what happened.” says Mikkelson.